In 2014, Paget Haylon, a social worker by trade, was looking for something meaningful to do with her time. After coming across an article in her local Newtown paper about the opening of Regional Hospice and Palliative Care’s Center for Comfort Care and Healing, she decided to apply to become a hospice volunteer. Over the past four years, Paget has volunteered over 1,500 hours supporting hospice patients and their families through her multitude of volunteer roles. After completing a 24-hour family support volunteer training, she was among the first group of volunteers to give her time to our in-patient Center. In this role, Paget helps support terminally ill patients and their families in their final days, weeks, and months of life. She sits with dying patients, often holding their hands as they take their final breath. She listens to patients and family members as they tell her stories about their lives. She provides hugs to loved ones after they say their final goodbyes. She provides patients with companionship and is often seen laughing with them at their bedside, walking with them through the gardens, or wheeling them through the hallways. And she supports the staff by taking on projects of all multitudes to help lighten their loads, enabling them to focus on the compassionate clinical care they are providing. At least twice a week year-round, Paget is at the Center, dedicated to helping people at a difficult time. Paget also generously gives her time as a camp counselor each summer for our “Good Grief” camp to care for children who have suffered a significant loss in their lives. For Paget, watching these kids run around and have permission to “just be kids” is incredible. Paget is astounded and humbled that patients regularly let her and the other volunteers “in,” allowing her to walk with them at the end of their lives. She considers it the ultimate gift to be with people and help them take their final journey. Admittedly, it took Paget a while to get to this place of peace. For a long time, she avoided working with the elderly because she was afraid to learn what they would tell her or show her about the end of life. Volunteering at hospice has been a gamechanger for her. Working with people of all ages at the end of life – not just the elderly – has shown her that there’s nothing to be afraid of. She is a lot more comfortable with her own mortality and can talk to loved ones about important end-of-life issues without the negative emotion that was attached to it before. For Paget, there is so much positivity when she is spending time with hospice patients. There’s a lot of laughter and light. She learned that death doesn’t have to be a scary thing. Even four years into her volunteer role, Paget can’t help but smile when she thinks about her volunteer work. She explains that she loves being with people and loves hearing their stories. When the weather is nice, she enjoys taking patients out into the beautiful gardens at the Center. When a patient is alone, she offers her presence and companionship: holding someone’s hand and telling them that she’s there to sit with them for a while, even if they are non-responsive. She loves making people laugh and laughing together. Through this work, so many patients have found their way into her heart. As one of the more seasoned volunteers, Paget is also passionate to share her experiences with new volunteers, serving as one of our most frequent trainers. She loves coming to volunteer trainings to talk about her experiences and provide encouragement to the new volunteers. She knows firsthand how challenging it can be for new volunteers to be in an environment filled with a complex array of heartfelt, intense, humorous and sad moments – oftentimes within the same shift. Because of this, she takes the time to check in with them regularly to make sure that they are doing okay. 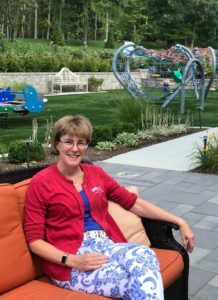 One of the things Paget enjoys most about volunteering her time for Regional Hospice is that she’s found “her people.” She finds that everyone – the nurses, the aides, social workers, chaplains, and other volunteers – are just amazing. Through this role, she’s made friendships for life.